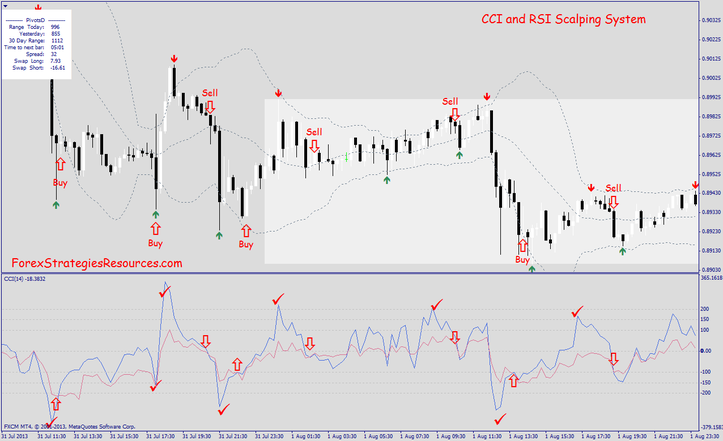 This is a reversal momentum scalping system based on two forex indicators in the same window CCI and RSI. Time Frame 15 minutes or 30 minutes. When CCI is in oversold area ( CCI<=-150 level) buy when cross upward (RSI 14) . When CCI is in overbought area ( CCI>=150 level) buy when cross upward (RSI 14) . Fast profit target 8-15 pips depends by currency and time frame. At the pivot points level. Iniltial stop loss 15 -20 pips after 8 pips in gain move stop loss at entry level. This is a good scalping strategy for provider trading signals intraday. In the picture below Reversal momentum scalping system with CCI and RSI in action. Share your opinion, can help everyone to understand the Reversal momentum scalping system with CCI and RSI.